I started early morning from Siliguri in the plains, and reached the trailhead, a small town named Mane Bhanjang (elevation 6,600'), within a few hours. The road zigzags over the Indo-Nepal international border. In fact, the trek itself straddles the international border. 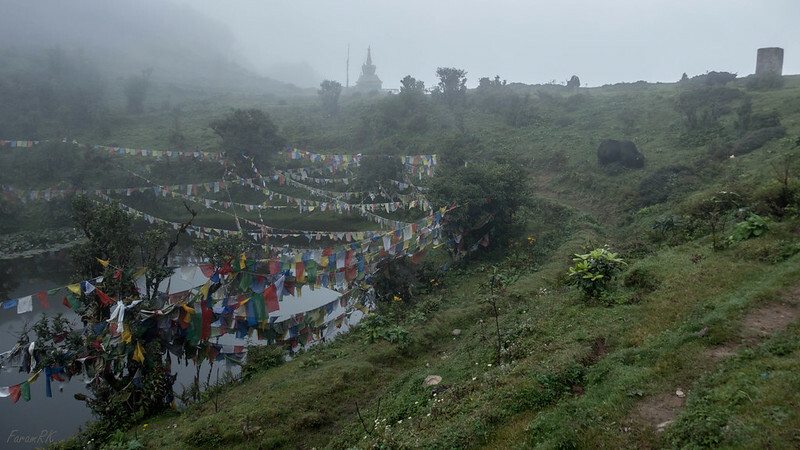 For more about the drive to Mane Bhanjang, please refer to my Tonglu Day Hike post. On reaching Mane Bhanjang, I met Vinod, my guide for the trek. Its mandatory to hire a licensed guide when trekking inside Singalila National Park. Vinod was a great hiking companion and a wealth of information on the local lore, flora and fauna. After registering at the Forest Check Post and paying the park permit fees, we started the uphill climb at 09:10. I carried everything, except food (which we would procure at lodges/teahouses along the trail), in a 65L backpack weighing a bit over 17 kg (38 lbs). Weather was misty and got progressively worse as the day progressed, with visibility reducing when clouds rose over the valleys into our path. We hiked on hiking-footpaths which consisted mostly of mossy, slippery stone slabs. In parts we also walked on a concrete road which intersected the hiking footpaths at various points along the way. 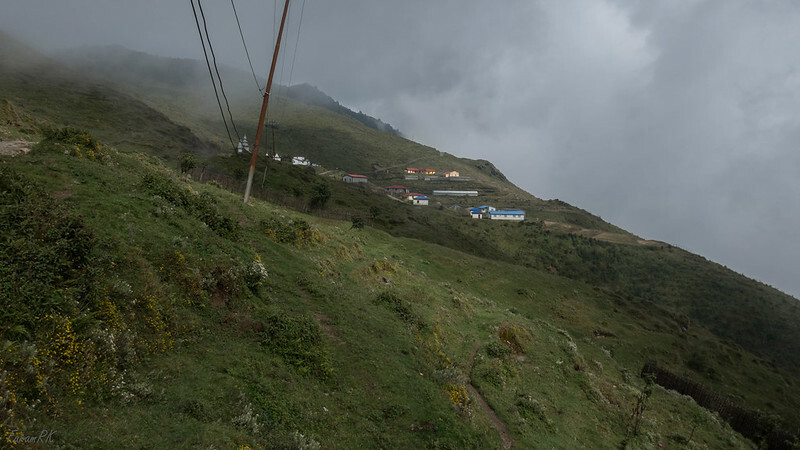 After 2 KM of a continuous moderately steep uphill climb, we reached Chitre (7,700'), a collection of teahouses and huts, at 10:00. We would carry on hiking on the ridgeline until Meghma. We resumed the hike after a 20 minute tea break. After Chitre, the gradient became relatively shallow and the muddy/grassy trail passed through meadows. This was the easiest part of the hike. It's a joy to hike on mud/grass surface as its soft & springy and easy on the feet, especially when carrying a loaded backpack. We passed by Lama Dhure (8,500') , a few KM up the trail, at 11:25. This place was even smaller than Chitre, consisting of a teahouse and some huts. After another few KM, we arrived at Meghma (9,200') at 12:50. 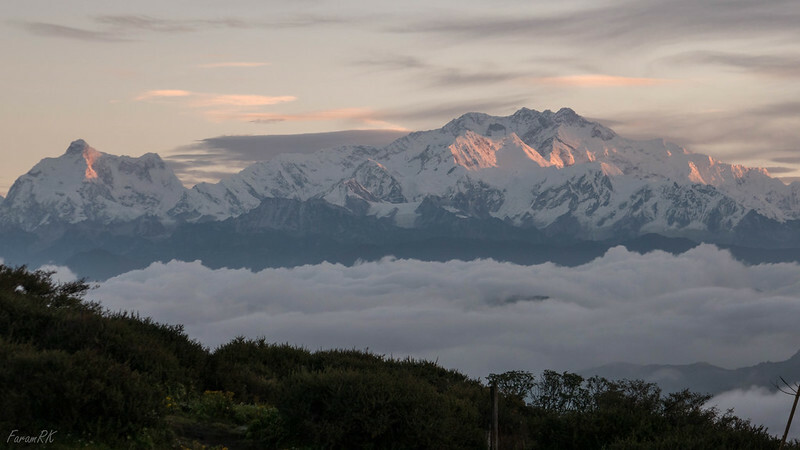 From here, we took the road leading towards the left, which was wholly in Nepali territory, traversing the the west face of Tonglu (9,990') towards Tumling. This 'road' was a nightmare. The road surface must have eroded in the 19th century (just guessing 😁), leaving large pointy stones jutting out at all angles. These poked the soles of my hiking boots, causing painful feet after a while. I tried to walk on the grass/mud road shoulder whenever present, but these were few and far between. This kind of 'road' would last for a significant part of the way up to Sandakphu. We arrived at Tumling (9,500'), another collection of teahouses, at 14:00, in time for lunch at one of the teahouses. After half an hour, we resumed the hike. The rest of the way was downhill until the end of the hike for the day. Unfortunately, due to the nature of the 'road', it wasn't any easier than the uphill climb. It had started drizzling and we had to break out our rain gear. We continued along the west side of the ridge. A bit before entering Jaubari we had to check in at the local Nepal border police check post. We arrived at Jaubari (9,200') village at 16:00 and had a 15 minute tea break. By now the rain had picked up. Next was a steeper 700' descent to our destination for the day - Gairibas (8.500'). We arrived at Gairibas, which is located on a saddle, at sunset, 17:20. Visibility was just a few meters due to fog. I was too tired to blunder around trying to find a campsite to pitch my tent so opted to stay for the night in the GTA Trekkers Hut. Luckily, they had rooms available, and after an early dinner, I hit the sack at 19:15. This first day we covered 17 KM with 3,000' of ascent and 1,000' of descent, in 8 hours 10 minutes. The weather had cleared quite a bit when I got up at 05:30. It was 15°C inside the room. After breakfast, we departed Gairibas at 08:00. We needed to sign in at the Indian SSB border check post. It's just a formality as its an open border all through the trek. 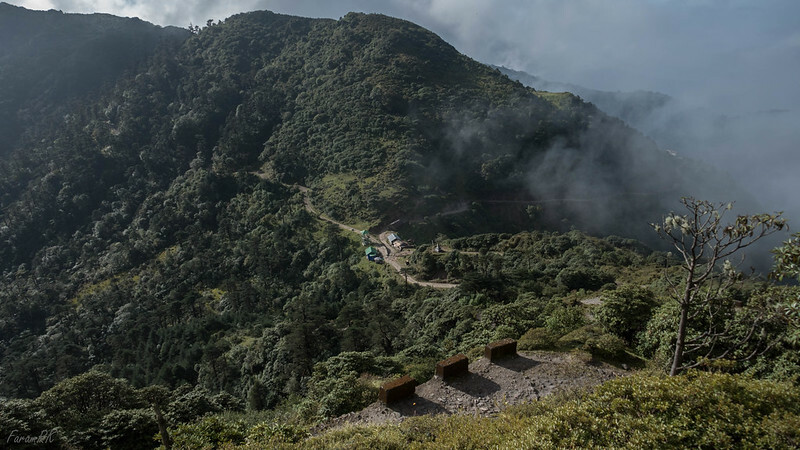 The following sections would be uphill climbs interspersed with relatively flat sections. After a moderately steep climb along the ridgeline, we now travelled along the east face of the ridge climbing gradually until we regained the ridgeline at Kal Pokhri (10,000'). We rested for half an hour along with tea and biscuits. By the way, between rest breaks, I kept fueled & prevented cramps (due to sweating/dehydration) by consuming hydration/electrolyte powder mixed with water, along with the great Indian trail mix - salted Kaju-Kismis (cashews, raisins). It had started drizzling by the time we resumed the hike. Next was a relatively flat section along the west face of the ridge to Bhike Bhanjang (10,300') which we arrived at 12:20. After a 10 minute break, we started the final continuous climb to Sandakphu. 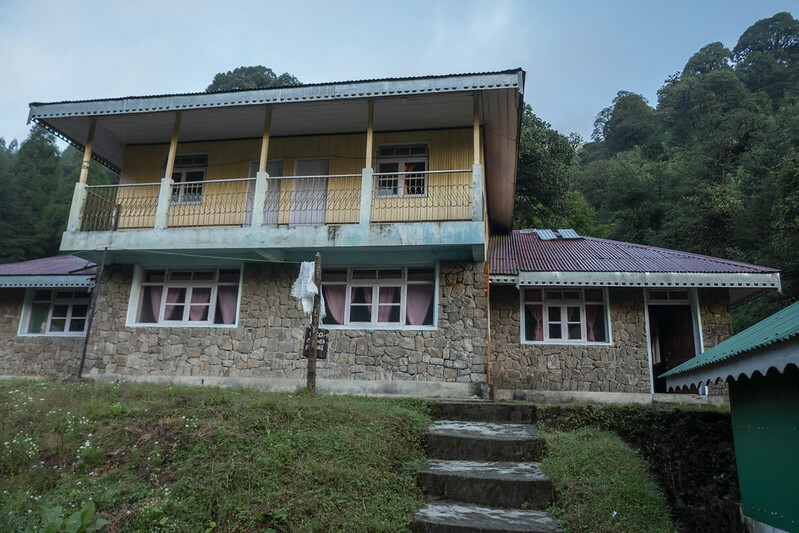 We arrived at Sandakphu (11,700'), a collection of lodges/teahouses, on the top of the ridge at 14:30. But we needed to walk another 1.3 KM further up the road to reach the campground, which we did at 15:00. By now it was raining continuously along with wind and fog. I had tea in the campground caretaker's hut while waiting for the rain to stop. Once there was a lull in the rain, I hurried to find a suitable spot and pitched my tent. The caretaker was kind enough to lend me a groundsheet on which to place my tent, over the soggy ground. I had the tent set up and habitable by 16:00 and then rested for a bit. My shirt was soaked due to sweat and rain and almost everything in the tent was either wet or damp. Although it was only 30 meters away, the caretaker's hut was invisible in the fog, I visited them at 18:00 for dinner provided by the caretaker. By 19:00 I was back in my tent, ready to call it a day. It was windy and raining all night long with the tent walls flapping noisily all the time even though I had guyed the tent nice and taut. 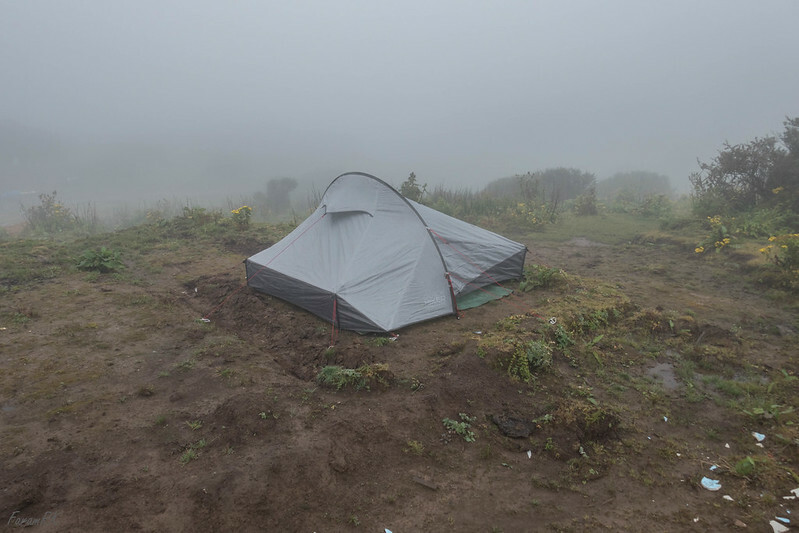 Unfortunately, the only spot that was flat, relatively dry and free of dzo/yak dung was near the edge of the ridge and aligned such that the clouds riding up the valley winds hit the tent broadside on. Anyway, I had great, relatively undisturbed sleep. There's nothing quite like being ensconced in a cozy sleeping bag while its cold, windy and raining outside the tent ! This day we covered 13 KM along with 3,200' of ascent in 7 hours. I got up at 04:30, before dawn, and checked out the moonlight bathed scenery all around. It was 8°C inside my tent and 4°C outside. There was cold condensation on the inside of the tent fly that I sponged off. The rain had stopped and the weather had cleared, although none of the surrounding peaks were visible, due to cloud. I had little hope of viewing the peaks due to the miserable weather of the last two days. As agreed upon the previous night, I knocked on the caretaker's door at dawn, 05:00, for a cup of tea, as the plan was to get moving at the earliest and head back the way we had come from. The idea was to complete the whole return trip in a single day if possible. 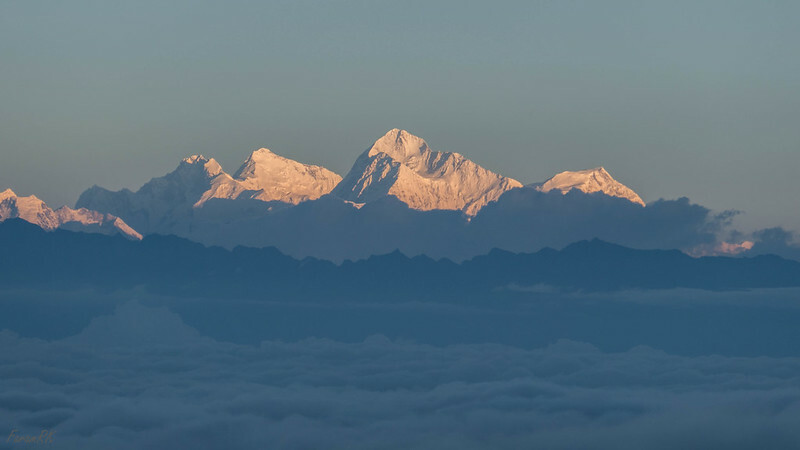 While having tea, Vinod beckons me outside and, lo and behold, most of the peaks are visible in all their glory - the grandest of all natural formations. The mighty Himalayas never fail to uplift the spirit, while at the same time giving a timely reminder of one's own insignificance in the greater scheme of things. You can see more photos of the peaks on my Flickr album - https://flic.kr/s/aHsmto3pYp. I was running behind schedule while I was feverishly clicking photos left and right. After hurriedly striking camp, we started the return hike at 06:43. We wanted to reach the trailhead by dusk if possible. We retraced our footsteps of the previous two days, mostly downhill now. We passed by Bhike Bhanjang at 08:10. By now, clouds had again started sporadically moving up the valleys. We reached Kal Pokhri by 09:00 and after a hurried breakfast, were on the move again by 09:15. This quick march downhill with loaded pack was aggravating the feet pain (Metatarsalgia) caused by walking on the rocky 'roads' of the past few days, and by 11:00 I was in quite a bit of pain. We reached the Gairibas saddle at 11:50 and took a 20 minute tea break. I also popped a painkiller tablet to ease the pain. I could see that we were running behind schedule. The next sections would be uphill climbs for a bit. We reached Jaubari at 13:30 and halted for half an hour for lunch. If it wasn't for the feet pain, we could have proceeded faster and with much shorter breaks. We passed by Tumling at 15:25, after which it would be downhill all the way, but we wouldn't be rid of the horrible 'road' until the next hamlet, Meghma. We passed by Meghma at 16:15. We had to stop on the trail at 17:00 as a large blister on my left foot was swishing around uncomfortably, in addition to the ever increasing metatarsalgia pain. I removed my boot and tried to lance the blister with a heated sewing needle, but the liquid just kept bobbing around so I gave up and resumed the march. We reached Lama Dhure at 17:40 and halted for a 10 minute tea break and to give my suffering feet a break. It was already past sunset, and a bit after Lama Dhure, it became totally dark by 18:00. Now we were walking with the help of our headlamps. My speed had become quite slow and we had to take frequent breaks to rest my feet. When I looked up at the sky, a multitude of stars shone brightly, and I could see a faint outline of the Milky Way. But I was too far gone in pain to bother setting up my camera for a long exposure night sky shot. We reached Chitre at 18:50. Now there would be a continuous moderately steep descent. Descents aggravated the feet pain much more than ascents. Just when I thought things couldn't get any worse, the fog rolled in ! Failing headlamp in the fog at night isn't fun. The next hour or so was a painful experience with me hobbling along with my backpack. At last we reached the trailhead at Mane Bhanjang at 20:00 i.e. 2 hours after dusk, and 13 hours 17 minutes after starting the return hike from Sandakphu. The headlamp batteries gave up completely at this point. The distance was 30 KM with 5,200' of descent and 1,000' of ascent. I stayed overnight in a homestay, glad to rest to my long suffering feet, and too exhausted to bother having dinner. Lights out. * Average speed includes all breaks. 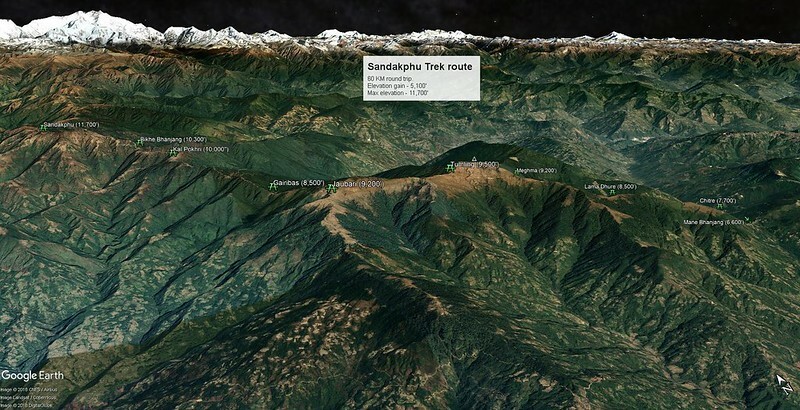 The fastest recorded ascent from Mane Bhanjang to Sandakphu is 4 hours ! This record was set in the annual Himalayan 100 running race. Amazing photos. Next stop Mt Everest?